FILE: In this photo taken on Friday, Sept. 2, 2016, Turkish tanks head to the Syrian border, in Karkamis, Turkey. 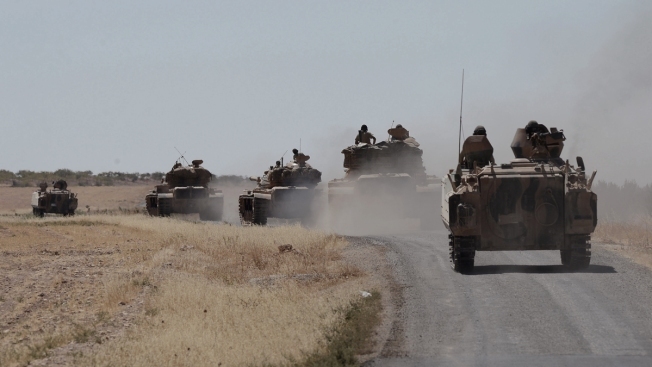 Turkish troops and allied Syrian rebels expelled the Islamic State group from the last strip of territory it controlled along the Syrian-Turkish border on Sunday, effectively sealing the extremists' self-styled caliphate off from the outside world, Turkey's state-run news agency reported. An Arizona man was convicted Monday on charges he helped a New York college student join the Islamic State group in Syria, a verdict Manhattan's top federal prosecutor offered as proof that civilian courts can handle terrorism cases. Ahmed Mohammed el-Gammal, a bespectacled suburban Phoenix man, did not immediately react as the jury foreman read the verdict to end the three-week trial. In a statement, U.S. Attorney Preet Bharara cheered the verdict. "Once again, we have shown that terrorists and terrorist enablers can be brought to justice fairly, openly and swiftly in the crown jewel of our justice system - civilian courts," Bharara said. The prosecutor called el-Gammal, 44, an "ambassador for ISIS right here in America," saying he actively touted and glamorized the group online, ultimately recruiting and helping Samy el-Goarany reach a training camp in Syria. Trial evidence consisted largely of social media communications between el-Gammal, el-Goarany and others before and after el-Goarany traveled to Turkey in January 2015. He reached Syria days later. Defense lawyers had warned jurors not to blame el-Gammal for online postings supportive of the Islamic State group and some of its worst tactics, including beheadings. The trial was the first Islamic State group-related prosecution to occur in Manhattan federal court, which has had more than a dozen terrorism trials in the last quarter century in buildings located just blocks from the World Trade Center towers that were destroyed in 2001. The jury foreman said jurors relied primarily on social media evidence, discounting trial testimony that included el-Goarany's mother, father and brother as government witnesses. The 24-year-old Baruch College student's brother and father both admitted lying to the FBI. The family received a letter in November 2015 saying el-Goarany had been killed fighting for the Islamic State group. Defense attorney Sabrina Shroff did not immediately comment on the verdict. In a closing argument last week, she said el-Gammal was not guilty and that he did not know el-Goarany was joining the group. She said el-Goarany engineered his own fate as he looked for meaning in life to erase feelings of inadequacy. In his closing argument, Assistant U.S. Attorney Brandan Quigley told jurors to consider the social media they could not see. He noted that el-Gammal deleted 300 pages of Facebook messages and 969 or 970 encrypted messages related to the plot after el-Goarany told him he had trained with the Islamic State group. No sentencing date was set by U.S. District Judge Edgardo Ramos. El-Gammal faces a mandatory minimum of 10 years in prison.